Plot: A foul-mouthed former gymnastics bronze medalist with local celebrity status reluctantly trains a rising Olympics aspirant. Starring: Melissa Rauch, Gary Cole, Thomas Middleditch, Sebastian Stan. 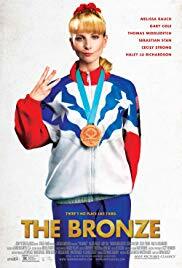 distributed by Relativity «The Bronze» in the US movie theaters released on March 18, 2016 and has grossed over $616k worldwide; dvd and blu-ray release date was set for August 2, 2016. Rent from Netflix and Redbox from August 2, 2016. «The Bronze» in the UK has no theatrical release date. DVD and blu-ray release date is not available at this time.